The aorta is the largest artery in the body. The abdominal portion of the aorta carries blood to the abdomen, pelvis, and legs. Sometimes the walls of the aorta weaken and bulge in one area. This is called an abdominal aortic aneurysm (AAA). AAAs are most often caused by atherosclerosis , also known as hardening of arteries, and high blood pressure . Reaches a size of 2 inches (5 centimeters) across or has been growing rapidly. Smaller aneurysms are watched closely. They are rarely repaired with surgery. Preventive AAA surgery generally has a good outcome for people who are relatively healthy. Emergency surgery to fix an AAA rupture has a much lower survival rate, because of rapid blood loss. The procedure varies. It can be done before a rupture as a preventive measure or after a rupture on an emergency basis. The preventive procedure is outlined here. You may need to stop taking certain medications 1 week before surgery. Talk to your doctor about your regular medications. You may be given laxatives and/or an enema to empty your intestines. You may be asked to shower the morning of your procedure. You may be given special antibacterial soap to use. This may be done as an open surgery or using an endovascular approach. In an open surgery, an incision is made from the breastbone to below the belly button. The aorta is clamped slightly above and below the aneurysm. Any blood clot on the inside of the aorta is removed. An artificial wall is used to strengthen the area. This is called a graft. The graft will be stitched to the normal aorta on either side. Then, the clamps are removed. The wound is closed with stitches. For the endovascular repair, a small incision will be made in your leg. A sleeve will be inserted in this incision and into the aorta. It will be advanced to the aneurysm. The sleeve will take pressure off the wall and prevent it from expanding or leaking. The incision will then be closed. 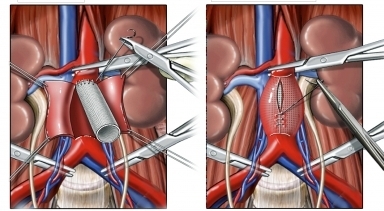 An artificial graft is stitched to the aorta. Anesthesia prevents pain during the procedure. Most people will be sore after the procedure and will be given pain medications. The length of your hospital stay depends on your overall condition. Ask your doctor how long you should plan to stay. You will be sent to the intensive care unit for monitoring. To help prevent further problems, you and your doctor will need to work to increase your overall health. This can be done with medications and a healthy lifestyle. If you are a smoker, you should talk to your doctor about quitting. Recovery takes about 6 weeks. If you had symptoms from the AAA before the surgery, you may notice some improvements in your health. You may find you have more strength and less swelling in your legs. You may also have lower blood pressure, improved energy, and absence of pain from the aneurysm. 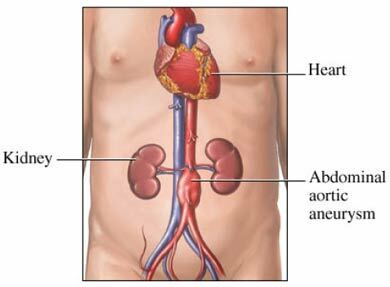 Abdominal aortic aneurysm (AAA). EBSCO DynaMed Plus website. Available at: http://www.dynamed.com/topics/dmp~AN~T114361/Abdominal-aortic-aneurysm-AAA. Updated January 11, 2018. Accessed March 1, 2018. Abdominal aortic aneurysm repair. Johns Hopkins Medicine website. Available at: https://www.hopkinsmedicine.org/healthlibrary/test%5Fprocedures/cardiovascular/abdominal%5Faortic%5Faneurysm%5Frepair%5F92,P08291. Accessed March 1, 2018. Aneurysm repair. The Texas Heart Institute website. Available at: https://www.texasheart.org/heart-health/heart-information-center/topics/aneurysm-repair. Accessed March 1, 2018. Hall SW. Endovascular repair of abdominal aortic aneurysms (Home Study Program). AORN Journal. 2003;77(3):630-642. 7/17/2017 DynaMed Plus Systematic Literature Surveillance http://www.dynamed.com/topics/dmp~AN~T114361/Abdominal-aortic-aneurysm-AAA: Reis SP, Majdalany BS, Ali F, et al. ACR Appropriateness Criteria for pulsatile abdominal mass, suspected abdominal aortic aneurysm. Available at: https://acsearch.acr.org/docs/69414/Narrative. Updated 2016.